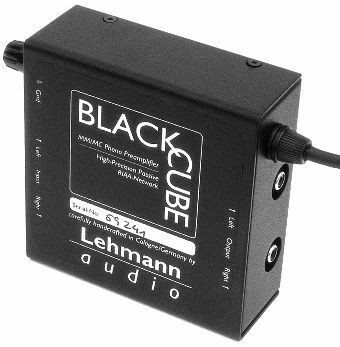 If you're not new to the Web and analogue audio gear, you should know the Lehmann Black Cube, one of the most popular and widely appreciated budget-conscious versatile phono preamps in the market. The Black Cube owes much of its populariity to the Net and the first very positive reviews that appeared on the WWW. Then the major print magazines followed and the success of the unit was assured. The secret of this little black box lies behind its minimalist multi-purpose no-frills sano design. For the technicalities of the Black Cube let me address you to our review of the first version of this preamp or visit the official website. While the original design remains virtually unchanged, some relevant areas have been bettered: now the metallic case is made out of aluminium, because of its non-magnetic properties (relevant for a phono stage!). So the Black Cube is much lighter than the first version. Inside, new, higher quality op-amps have been used, a new power cord between the main unit and the outboard PSU plus the possibility to use a hi-quality mains cord to connect the PSU to the mains. Previously the PSU was directly connected to the mains wall socket. This way the outboard power supply can be located very far from the main unit and the turntable. Sano! The new Black Cube has been tested head to head with the old version, during 4 months into at least 3 different analogue set-ups. First of all, the original character of the Black Cube hasn't been changed much, thanks God, as it was an excellent mix of solid state liveliness and tubey grace. But it ain't just "another" version, virtually unchanged and designed just to keep up with the market's pace. No, the Black Cube has been bettered in some area. For example the sound of the mid-high range is now smoother, sweeter and more refined. Less grainy and with a lower level of perceived distortion, even with tough complex musical programs, the new Black Cube gives an additional "blow" of air to the Music it plays. In a word, more airy. Thanks to the increased quality of the mid-high range the new Cube goes one step closer to hi-end performance at a price that - hear hear! - is still the same as before. All comes at a price, though, and I can't help but confess that the previously OUTSTANDING bass performance of the Cube is no longer the same. Yes, the bass range has more control but it appears to be a little bit "shy" if compared head to head with that of the previous version. Its bass is still very punchy and deep but the sheer energy of the previous version is somehow lacking. I'm not talking of day-night differences here, just subtle sensations, confirmed by several listeners into different systems. Hence, the dynamically involving sense of "pace" the Black Cube used to have, appears to be less intriguing, less of the "clap your hands and STOMP your feet" kind. If you've never listened to the old Cube you will notice nothing, as the new Cube is still pacey and groovy. I'm just saying the old version was a little bit better in this area. As for soundstaging: now a little bit less deep, it has been bettered in terms of precision, clarity of the contours and focus of the virtual image. Width and height are virtually the same. The bottom line is: it depends on what you prefer. If you're a rock-headbanger, always striving for dynamics and punch you'll probably prefer the first version. If you're after precision, details and smooth sound you'd probably find the new Cube a far better choice. Overall, I'd say the new Cube is better than the first version, though I'd love to hear a third version with the pluses of the 1st and 2nd "edition" put together into a single unit. The Black Cube, though still a new kid in the block, can be easily considered a "classic", a challenge for every HiFi manufacturer. It was extremely good, it has been bettered in some area, not an easy task. It has lost some of its brutal energy in the bass during the process but it is still one of the best phono preamps into its price range and above. Any serious analogue-addict should listen to it before buying anything else. Thanks to Norbert Lehmann for the Cubes under review.